Singer, songwriter, poet, educator, writer, and presenter, Suni Paz has devoted her life to children and their families. She has thrilled worldwide audiences of all ages on stage, television, and radio with her stories in song accompanied on guitar, charango, and percussive instruments. Born in Argentina, she lived in Chile for five years and then moved to the United States with her children. She received a master’s degree at Rutgers University in Hispano-American literature; a grant from the Center for International Education; and Fulbright, Atlas, Tinker Foundation, and several other awards. The latest was the Parents’ Choice Award for a children’s CD with the Smithsonian Institution. 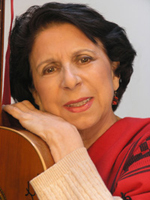 Since 1984, she has been involved in an ongoing collaboration with award-winning writers and poets Alma Flor Ada and Isabel Campoy, setting their lyrics to music and recording them. She has recorded and published more than four hundred songs. In 2007, Del Sol Books published her memoirs in Spanish, Destellos y Sombras, and in English, Sparkles and Shadows. Five of her poems are in a book entitled La sublime locura de ser poeta. Suni believes in the art and power of music and words to change, inspire, and heal.